Daily Prompt: From your musical tastes to your political views, were you ever way ahead of the rest of us, adopting the new and the emerging before everyone else? When it comes to music, I’ve found that a lot of people I have been to see have now become ‘stars’. Usually I’ve really enjoyed the support acts at a concert and have bought tickets after to see them do some small gigs. An example of this is when The Vamps supported McFly last year. They were only really known by a few people back then and when my friends and I waved at them, they got so excited because they were actually being acknowledged! I went to see them again earlier this month – in a full arena. Back at school, one of my teachers told us that he really liked this singer called Jessie J. We had never heard of her but watched a few of her videos on YouTube…and quite frankly thought she was a bit weird! A couple of years later and we were standing in the front row of a packed arena to see her perform! It just goes to show that anything can happen. Daily Prompt: Being Musically Thankful! but then I’d be lying. Without the people who read my blog I don’t think I would carry it on – that’s just the type of person I am! If I don’t have other people’s ‘confirmation’ of what I am writing, I usually don’t think it’s very good – so thank you for actually reading! The song was Paloma Faith’s “Only Love Can Hurt Like This” by the way! Daily Prompt: We all have songs that remind us of specific periods and events in our lives. Twenty years from now, which song will remind you of the summer of 2014? Definitely ‘Wiggle’ by Jason Derulo. Since starting this National Citizen Service programme four weeks ago, (and meeting loads of new people), it is all I have heard every day and all they have played. It’s in my head right now as I type! Daily Prompt: The friendly, English-speaking extraterrestrial you run into outside your house is asking you to recommend the one book, movie, or song that explains what humans are all about. What do you pick? The Heart Never Lies – by McFly, of course. The reason for this is that I was once listening to it as we drove through the mountains of the Lake District, and as we did I thought to myself: ‘If I ever have an alien exchange partner, I’m going to drive them up here and blast out this song.’ Yes, my mind is random like that, but the song itself says it all! Daily Prompt: What’s your most prized possession? GO! First is Monty, the teddy I got when I was just a teeny little baby in a hospital cot. He is older than me yet he still has his squeak and is surprisingly intact for saying I have had him for over seventeen years! I’m not afraid to admit that I still find it difficult to sleep without him, (and several other cuddly creatures who I have had to leave out of this post), and he has even starred in one of my previous daily prompt posts, (about soul mates I think)! 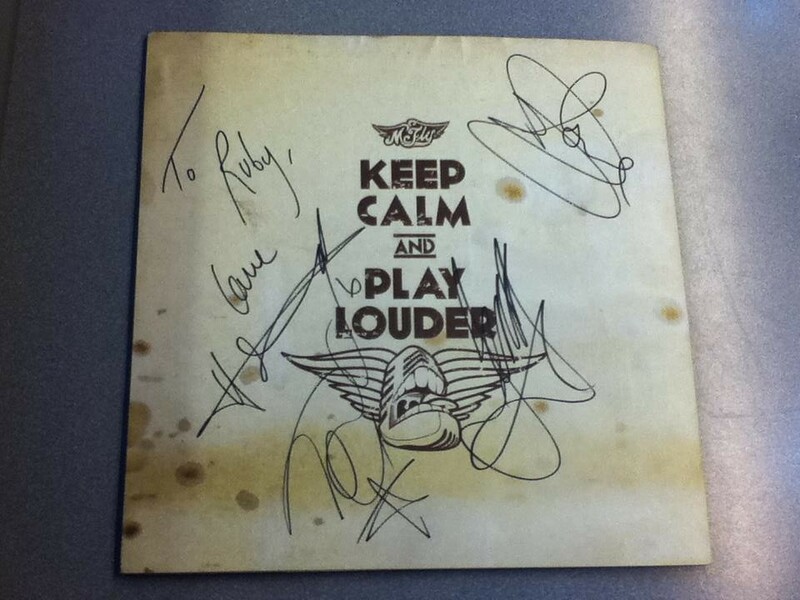 Second is… my signed McFly programme from their Keep Calm and Play Louder Tour. And I think I’m so proud of this because I didn’t just order a pre-signed item – I actually got on a train and travelled the 127 miles from Nottingham to London, then had to track down the hotel the meet and greet was being held at… and finally MET THEM! And they even wrote ‘To Ruby’! I’m sorry, it was just a very exciting and momentous time in my short life! Daily Prompt: Being a Partier! Daily Prompt: You’re throwing a party — for you! Tell us all about the food, drink, events, and party favours you’ll have for your event of a lifetime. Use any theme you like — it’s *your* party! The party I have in mind would require a lot of money and a large field and a warm summer night… so no, it’s unlikely that it will ever happen! In the field, there would be a traditional fair with all the old-fashioned rides you see in the movies – a carousal, bouncy castle, helter skelter, Ferris wheel, coconut shy – you get the idea. So I suppose I’d go with fairground food as well; hot dogs, candy floss, burgers, pop corn – and doughnuts… a lot of them. And I’d quite fancy the Grease soundtrack playing in the background! As the night wears on, we would have a bonfire on the other half of the field, with lots of music and dancing and marshmallows. Then, when it all became too much, we would retire to our teepees filled with cushions and blankets and fall asleep… until the morning, when we’d do it all again because I hate to see good things end! Daily Prompt: Being a Fangirl! Daily Prompt: Who did you idolize as a teenager? Did you go crazy for the Beatles? Ga-ga over Duran Duran? In love with Justin Bieber? Did you think Elvis was the livin’ end? Well, I’m still a teenager at seventeen. And, as people who have read some of my previous posts will know, my idols are obviously McFly, (get what I did there with the ‘obviously’?!) Anyway, they are absolutely and amazingly talented, funny, kind… you get the idea. I love them. A few years ago, I got to meet them in London and I cannot describe the feelings I had during that forty-five minutes. 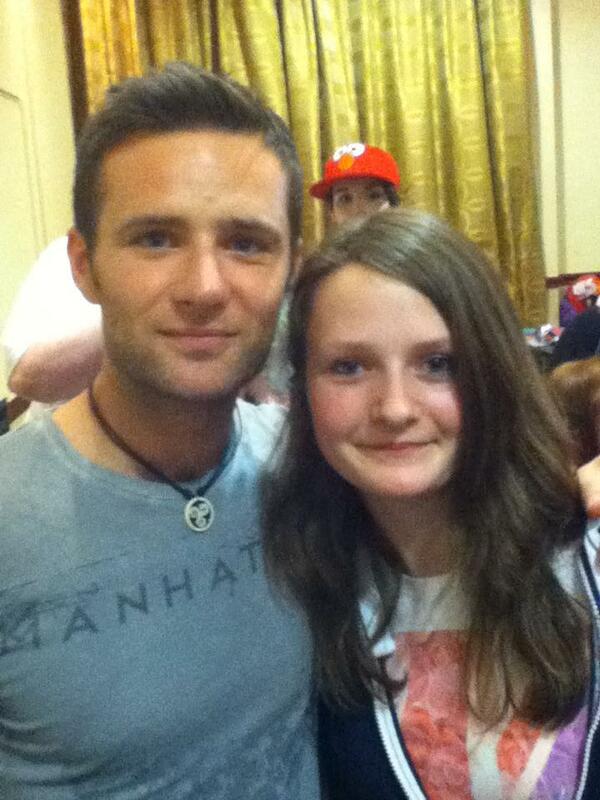 I managed to get one picture with Harry Judd, but I’m definitely not complaining! Daily Prompt: Have you ever become obsessed with something? Tell us about something that captivates your attention like nothing else. Would it be silly to say McFly? I love them so much. If one of their songs comes on in a public place, you’re most likely to find me in the middle of everything having a happy fit and singing along! I’ve never been more obsessed with them though since after the second Keep Calm and Play Louder concert I went to. For several days after, I suffered from that terrible PCD, (Post Concert Depression), that I think every teenage girl will experience at some point in her life. I remember that for three days, I went to school, came back and watched almost every single McFly interview and video there is on the internet. Then, once that had been done, I went back to my normal self… weird!